Ready to buy a diamond engagement ring in Portland? Ask these 10 questions when evaluating a diamond engagement ring and walk away confident in your purchase. Josh & Lindsay, A Perfect Oregon Coast Engagement! Meet Josh. He recently shared with us the story of his engagement to Lindsay. We loved it so much we wanted to share it with all of you. Josh first came into Malka Diamonds to find a diamond engagement ring in early September. He worked with both Tessa & David. First, Tessa spent some time showing Josh our engagement ring inventory. He was pleased with one particular style right off the bat. It was a cushion-shaped halo diamond ring. Next, Josh sat down with David and looked at several round diamonds. With some help from David, Josh found the perfect stone. It was a stunning 1.18 carat round briilant diamond. Once the stone and ring were chosen, Josh had a request. The semi-precious aquamarine stone is incredible important to Lindsay. Josh wanted to make sure to use this blue stone in the design of her engagment ring. As a group they decided to custom make the ring using aquamarines in the cushion-halo part of the ring. On Thursday, October 27th, Josh came in to pick up the ring. David can recall the day Josh came in because he clearly was thrilled with the way ring came out and was excited to propose to the love of his life. We are truly honored to be part of this wonderful engagement story. Thank you Josh for sharing this exciting moment with us. "Lindsay and I met in Charlotte, NC through a mutual friend and became really good friends over the course of about a year. I ended up getting a job offer in Portland when I was vacationing here and before I moved, we both realized we were much more than friends. She took the plunge and moved here to be with me 6 months later. 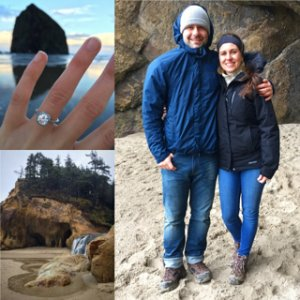 We got engaged while driving up the coast from Tillamook to Cannon Beach on November 7th. It was a really windy, rainy day but we pulled off anyway at Hug Point Beach to explore. The tide was out so we were able to walk onto a second part of the beach that had a waterfall and series of caves. The wind and rain really started to pick up at that point and we ducked into one of the caves. That is where I asked Lindsay to be my wife."